During the closing months of 2012, Slovenia has seen a series of mass popular protests. Thirty thousand demonstrators gathered on November 17 for the first protest, organised by trade unions, students, and organisations of retired people and artists. Dozens of protests followed, large and small, taking place in virtually all of the urban settlements of Slovenia, often organized spontaneously through Facebook and other social media. We would like to clarify to international observers that these demonstrations are not “rebellions against austerity measures and necessary reforms“, as the ruling rightwing neo-liberal autocratic government of Janez Janša has tried to depict them. The demands made by Slovenian citizens on the streets of their country are not merely for improved economic conditions, but for the basic foundations of a just and democratic state: the rule of law, the preservation of social services, and a sustainable economic policy that will serve the interests of the majority of the population rather than the narrow interests of a few. To provide some background on the situation, let us first emphasize that protest has been an extremely rare event in this traditionally calm nation of two million people, a country that has enjoyed a healthy economy and dignified living standards under a variety of different forms of government. Even current statistics show Slovenia’s relatively healthy condition: 89% of EU GNP, public debt at 48% of GNP, public deficit at 6.3 % in 2011. As the first and only of the former Yugoslav republics to enter the EU, NATO, OECD and the eurozone, Slovenia has been justifiably praised as an exemplary and successful former-socialist country. In 2009, the global economic crisis began to affect Slovenia not only due to shrinking European exports, but also because of misguided policies taken during the years of economic expansion (most during Janez Janša’s first mandate). In 2009, the Slovenian economy shrunk by 8% and the overheated construction sector disintegrated. The Slovenian economy entered a second recession in the last quarter. Protesters blame this new recession not only on the autocratic, neoliberal, corrupt and incompetent policies of the current government, but on a recent succession of corrupt self-serving governments. This is why protesters have recently demanded the replacement of the entire political elite. The government has responded with arrogance to the raised voices of its own citizens. The ostensibly representative government has consistently refused to enter into dialogue with protesters and had instead discredited and ridiculed their legitimate demands. This shameful response has only helped the protest movement to grow. 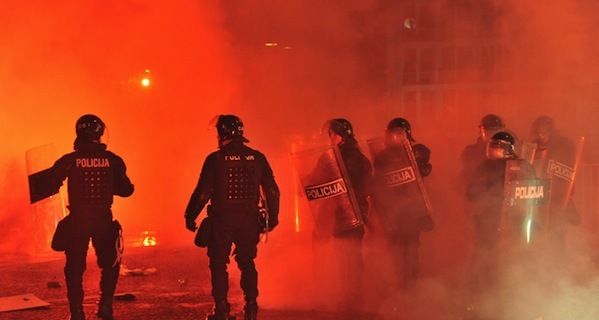 The government has also responded to the protests by closing down the centre of the capital city of Ljubljana, by using riot police, horses, armoured vehicles, water cannons, antiriot fences and helicopters in what can only be characterized as a gross overreaction to the largely peaceful gatherings of Slovenian citizens. The police has imprisoned large number of youngsters, misstreating them, holding them hostages, blackmailing their parants to stop protesting, if they want to see their kids liberated. Prime Minister Janez Janša has described the protesters as “extremist left zombies” and characterized them as radical “neo-socialists” in an effort to balance out the actual presence of neo-Nazis (possibly organised by the ruling government itself in an effort to discredit the protests at the beginning of the movement). Again this insulting government response has backfired, drawing more and more angry citizens into the streets. The right-wing populist autocrat Janez Janša, a supporter and personal friend of his Hungarian opposite number Viktor Orban, has, during his two mandates, attempted to take over the mass media, many of the country’s most profitable industries, and a host of other institutions, packing boards and management position with his own party members. The government is thus attempting to hinder free speech and a free press and to use public telecommunications networks as a mouthpiece of his own party. Measures have also been taken by an increasingly politicized Constitutional Court to block the constitutional right for referenda (plebiscites). The dysfunctional legal system, the privatization of public funds, and hasty and extreme austerity measures has only aggravated the economic crisis, starving and destroying whole sectors of Slovenia’s once healthy economy. To the dismay of its citizens, Slovenia is looking more and more like an autocratic neo-liberal banana republic. The following are other actions that have been taken by the ruling government in the year since it took office with less than 30% of the popular vote and 20 % of the present popular support : attempts to hamper the free speech of public media by cramming boards with politically-appointed members and threatening media and journalists for open reporting about the demonstrations, the economic starvation of Slovenia’s public universities in favour of new ideological state-financed “private” ones, the economic starvation of public schools and pre-schools, a war of attrition waged on Slovenia’s research community and cultural institutions, the increased enrichment of an economically corrupt and politically extreemly active Roman Catholic Church in Slovenia. All of these measures draw a grim picture of the future of Slovenia. The ruling government pursues a policy of dividing and conquering the population, attacking trade unions as the enemies of progress, attacking the public sector as a parasite of the private sector, attacking artists as parasites of both, attacking retired people for spending the future of the younger generations. The protestors’ response to this ugly and divisive policy is to call for solidarity and to summon true Slovenian patriotism. The protests that are taking place in Slovenia’s urban centres include all segments of the population: old and young, retirees and students, professional and working class, public servants and private entrepreneurs. Newly published polls reveal that 16% of the population taken active part in the demonstrations, 67% support them, and 85% of population expect the protests to continue. On December 22, 2012, cultural organizations in Slovenia organized a “protestival” that drew over 1,000 participants. It was a lively artistic event, offered as an alternative to the official state celebration of the Independence Day, and suitably named Mother Slovenia. The day before that an estimated 12,000 people, many of them young, took part in an all Slovenian uprising in Ljubljana. Several thousand gathered in Maribor and other smaller Slovenian towns. It is extremely significant that organized veterans of the 1991 Slovenian war of independence also took part in the protests, spurning the government of Janez Janša who counted on the support of these patriotic citizens without whom independent Slovenia might not exist. New protests have been announced for January. New resistance organisations are being founded o a daily basis. A congress of protest-Slovenia is being prepared for mid-January to connect all the diverse groups and organisations that stand in opposition to the current government and to the direction it has taken the country. The purpose of the congress is to define a unified action program to forward common goals of the protesting Slovenia. Although the authorities seem not to be aware of that, most observers here agree that nobody can stop the growing protest movement now from achieving its goals. I read this article and found it very interesting, thought it might be something for you. The article is called Slovenians Demand Radical Changepr and is located at http://criticallegalthinking.com/2013/01/15/slovenians-demand-radical-change/.